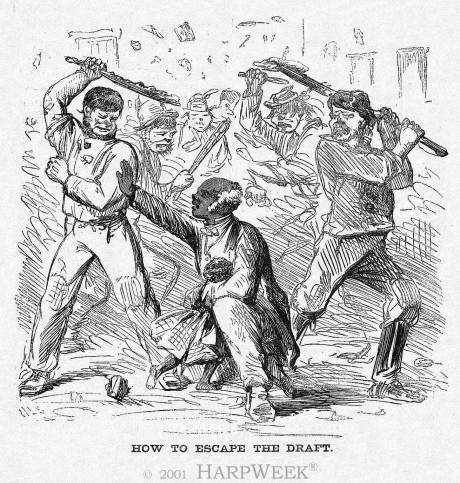 On July 13, 1863, anti-draft violence erupted in New York City, resulting in four days of bloodshed, arson, looting, and mayhem. The New York City Draft Riot, with an official death toll of 119 (which many at the time thought too low), remains the bloodiest outbreak of civil disorder in American history. In this cartoon, a gang of Irish-American rioters prepares to assault an elderly black man who shields a black child in his arm. By the hot summer of 1863, New York City was a smoldering cauldron of racial, class, religious, and political resentments.